I ranked them this year, unlike the 2005 list, so let the arguments begin. (Like the 2005 list, there are again eleven discs here.) The classics got a strong vote of confidence this year, and the newer music didn't do so badly on disc, either. 1. (tie) Beethoven Symphony No. 9. 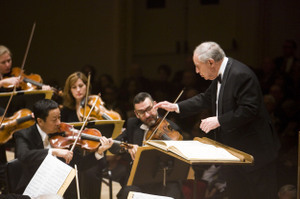 West-Eastern Divan Orchestra, Daniel Barenboim, conductor. Soloists: Angela Denoke, s; Waltraud Meier, m-s; Burkhard Fritz, t; Rene Pape, b-b. (Warner Classics) The young musicians tear into Beethoven's monument and follow Barenboim's fluctuating phrasing with ease. Same work. London Symphony Orchestra, Bernard Haitink, conductor. Soloists: Twyla Robinson, s; Karen Cargill, m-s; John Mac Master, t; Gerald Finley, b. (LSO Live) Haitink's streamlined interpretation makes a more restrained case for the work, and the vocal soloists are a little lighter, less grandly operatic, than those with the West-Eastern Divan Orchestra. Both are live recordings, incidentally. 3. Music for String Sextet: Strauss, Berg, Schoenberg. Artemis Quartet with Thomas Kakuska, viola, and Valentin Erben, cello, both from the Alban Berg Quartet. (Virgin Classics). Verklaerte Nacht's haunting, small-scale original version and an imaginative transcription of Berg's Piano Sonata, Op. 1, by AQ violinist Heime Mueller plant this disc by the most aggressive young European string quartet on this year's list. 4. Complete Sequenzas and Solo Works. Luciano Berio, composer. Various artists. (Mode). Mode's complete set of Sequenzas was more than 10 years in the making, and could've appeared at the same time as DG's. These works, which take virtuosity as a given, include a spellbinding version of the piano sequenza by Aki Takahashi and the only available account of the bass sequenza, by Stefano Scodanibbio, who made the transcription with Berio's blessing from the cello sequenza. Stunning. TOC article. 5. The Sonatas and Partitas. J.S. Bach. John Holloway, baroque violin. (ECM) Holloway's earthy interpretations unearth (ha) new sounds in these familiar standbys. 6. Complete Preludes for Piano. Claude Debussy. Steven Osborne, piano. (Hyperion) Exquisitely measured and etched playing from the predictably excellent Scottish pianist. 7. Songs of a Fairy-Tale Princess, Harnasie, etc. Karol Szymanowski. Iwona Sobotka, soprano; Timothy Robinson, tenor; City of Birmingham Symphony Orchestra; Simon Rattle, conductor. (EMI) He may clog my mailbox with more unnecessary recordings than anyone else (that deadly dull La Mer, anyone? ), but Simon Rattle's vivid, electric disc of Szymanowski's orchestral and choral works makes up for it. I'm considering a law that requires every currently scheduled performance of Carmina Burana be changed to feature the ballet Harnasie, instead. Same level of excitement, music that's ten times better. 8. Warp Works and Twentieth Century Masters. London Sinfonietta. (Warp). Ligeti's lively Chamber Concerto along with Nancarrow and Aphex Twin transcriptions. 9. Complete Piano Trios. Mozart. Daniel Barenboim, piano; Nikolaj Znaider, violin; Kyril Zlotnikov, cello. (EMI) Not Mozart's most inspired works, but with mentor Barenboim leading the younger generation, it's worth it. 10. Ein Deutsches Requiem. Brahms. Susan Gritton, soprano; Hanno Mueller-Brachmann, baritone; Evgenia Rubinova, piano I; Jose Gallardo, piano II; Choir of King's College, Cambridge; Stephen Cleobury, conductor. (EMI) What, no orchestra? No, and it's fine. The two pianos elucidate Brahms' polyphony judiciously, and the intricate choral writing emerges clearer than ever. Honorable mention, the discs that almost made the list, and non-classical releases that deserve more play: What Exit? Jazz violinist Mark Feldman (ECM). Schubert, Death and the Maiden Quartet. Takacs Quartet (harmonia mundi). Schubert, Arpeggione Sonata. Jean-Guihen Queyras, cello; Alexander Tharaud, piano. (harmonia mundi). "Sound decision," Time Out Chicago, December 14, 2006. The details clarify the Chicago Symphony's entry into the compact disc and digital download business somewhat. " 'It may be that there are some works we want to make available that don’t need to fill up 60 or 70 minutes on a CD,' " [CSO association president Deborah] Card says. The International Contemporary Concert bucks the trend of holiday-themed concerts tonight in a Vietnam War-minded event at the Museum of Contemporary Photography. (An interview about the concert with ICE leader Claire Chase can be found below.) The exhibition of photographs by An-My Le is astounding, as well. Pictures of soldiers preparing for war look eerily like the real thing, as do those of Vietnam War-reenactors in the wilds of Virginia. How much do our perceptions influence what we see? How much (gasp) might they influence what we hear? Read Time Out Chicago's perceptive and opinionated Art & Design editor Ruth Lopez on that exhibition here. The posts about the Chicago Symphony's tour are now up, and can be found here, here, here and here. Tonight, Pierre-Laurent plays his recital, and regular blogging at this location will resume, from the Chicago office. The first of my blog posts on the Chicago Symphony's tour is now up. Check it out. I forgot a small parcel in a shop down in an East Village shop last night, and raced back to pick it up. A lady had graciously turned it back to the cashiers, and, when I offered to buy anything in the store for her in gratitude, she declined. "Your happiness is payment enough," she said. I must have a kind face. Or maybe she's the most honest person in the world. Either way, I was touched. I'm going to New York Friday to cover the Chicago Symphony's New York tour for Time Out Chicago. Blog posts of the tour will be found on the TOC blog and include tour features and various little snapshots—written and perhaps photographed—I come across. I'll link to those from here, but you can also just follow along over there. Also, Eytan Uslan writes that it's Napolean who's compared to Sylvester Stallone, not Reagan who's bested by Rambo. My mistake. The memory isn't what it used to be. "Military-musical complex," Time Out Chicago, December 7, 2006. Claire Chase, intrepid leader of the International Contemporary Ensemble, talks Nono, Crumb, and war, in great detail. Also, check out Eytan Uslan's new CD of old-timey piano music. He and I cut capers as musicology students at Indiana University, with Uslan penning a song at one point in the style of Tin Pan Alley on why Ronald Reagan was better than Rambo. (Good times.) And if you know of anyone else who can incorporate the "Charlie Chan" theme and Liszt into "Goodbye, My Lady Love," as Uslan does here, please let me know. The Messiah season begins in earnest tonight, and I'll be attending the University of Chicago's performance in the imposing yet cozy Rockefeller Memorial Chapel this evening, and reveling in Handel's evocative text painting Saturday in the neo-Byzantine glories of Saint Clement. (The parish is apparently ashamed of their church's beauty, so difficult is it to find pictures of its interior.) Sunday's a two-fer, with the Chicago Symphony's first Beyond the Score concert of the season featuring Gerard McBurney taking apart Bartok's Miraculous Mandarin (podcast preview here, video preview here), followed by Maya Beiser's multimedia Almost Human at night. I'll be in New York next weekend covering the Chicago Symphony's Carnegie Hall tour. More about that visit, and the museums whose riches and exhibits I'll also describe, anon.